This summer I accidentally grew some chamomile in my garden, and chamomile flowers have been a bit of a theme on my blog for the last couple of months. But it has just occurred to me that I haven’t yet discussed drying this herb. These flowers grew really easily from seed! I picked each flower when the yellow centre had developed a good dome shape. I collected as little stem and foliage as possible, because I noticed that this part of the chamomile plant had very little fragrance. Tip – I noticed that if I waited too long before picking, leaving the white petals to discolour or fall off, the useful yellow part would just disintegrate. 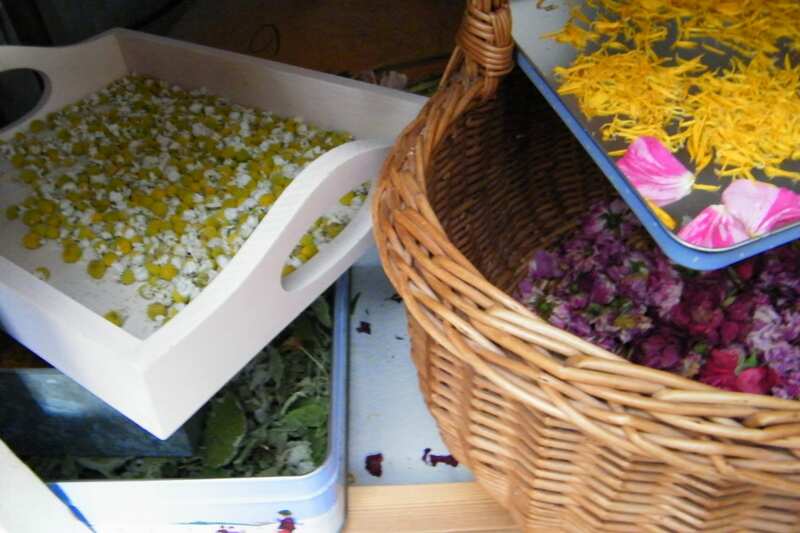 I laid the flowers out in a single layer on a tray to dry, and put them in my airing cupboard for a week or so (if you don’t have an airing cupboard, try these suggestions). Drying chamomile in my airing cupboard. Also visible are roses, marigold petals and sweet herb leaves. I harvested the blooms over a period of about six weeks, and when the herb had finished flowering, I pulled the plants up to make way for other crops. I have been using my homemade dried chamomile as tea, using a heaped dessertspoon for a large mug, and steeping for about 5 mins. Other uses might be:- in a bag as a soothing alternative to lavender, or sprinkled in a warm bath for a relaxing aromatherapy treat. Or try using the chamomile flowers as a hair rinse.